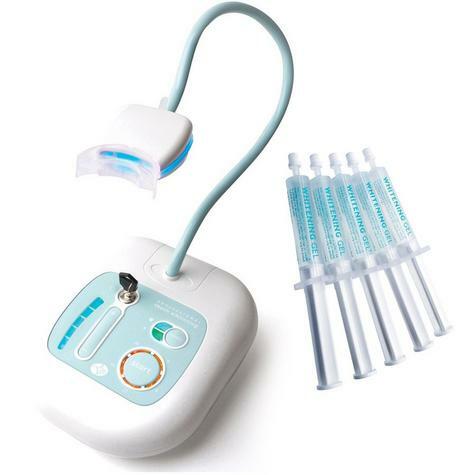 The Rio Professional teeth whitening system uses advanced blue light treatment technology to give professional results in the comfort of your own home. A specially formulated gel works in combination with the activating blue light for safe, rapid teeth whitening ideal for combatting stains caused by tea, coffee and red wine and discolouration due to smoking and ageing. The system has adjustable power and treatment modes, including a quick top-up option, and the long flexible support for the blue light array makes for easy comfortable use. Although found in different shades, when teeth begin to form they all grow with an external white enamel. The foods and drinks we eat, such as tea, coffee, red wine and strong colouring in foods, gradually stain this white surface. Abrasive toothpastes and hard toothbrushes (along with age) also accelerate the erosion of the tooth surface--the white enamel--exposing the yellow dentin core which lies beneath. Teeth often therefore appear yellowed and dull in colour. This product is not recommended for use by children under the age of 14 years. Do not expose the mouthpiece to extreme heat, such as a dishwasher, and avoid leaving in sunlight. The following steps should never be carried out whilst the mouthpiece is fitted onto the blue light transmitter. Place 4 cm of hot water from the tap (do not use boiling water) into a suitable container and submerge the end of mouthpiece for approximately 60 seconds. Carefully remove the mouthpiece taking care not to damage it whilst in a pliable state. Carefully shake off any excess water. Position teeth inside the channels, the mouthpiece will feel hot against your gums which is normal. Bite down gently. Hold in place for 30 seconds. Remove the mouthpiece and place into cold water to cool for 60 seconds. If necessary, repeat the steps to make the mouthpiece fit more comfortably. Your mouthpiece is now ready to use. Before using the professional teeth whitening treatment brush your teeth and use a mouth wash to remove any food particles. If there is heavy build-up of plaque and tartar on your teeth, it is recommended that you get your teeth cleaned by a dentist before you begin the teeth whitening treatment. Wash the mouth piece with warm water, (the mouth pieces are pre-sterilised). Push the mouthpiece onto the location tab on the front of the blue light transmitter. Secure in position with the band passing round the sides and back of the transmitter. Remove the cap from the syringe of whitening gel. Syringe a line of gel into the mouth piece. Replace the syringe cap. 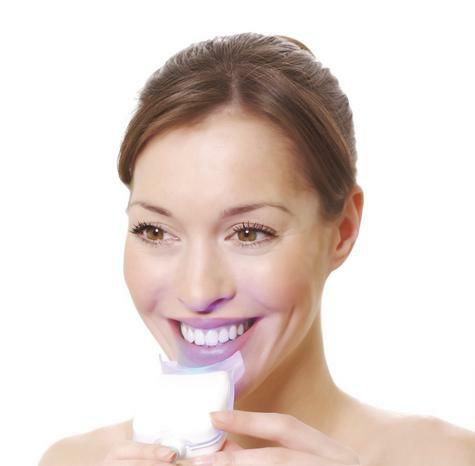 It is recommended that you progressively build up your teeth whitening treatments. Start with the ‘full treatment’ programme on level 1 power. With each successive treatment increase the power level until you have the desired whitening effect or are at maximum power. To maintain whiteness use the ‘top-up treatment’ programme which runs for just 12 minutes. Connect the mains adapter into the power adapter socket on the back of the unit and plug into the mains. Use the security key to unlock and turn on the unit. Press the mode button to select the programme you wish to use--the programme indicators will illuminate to show which programme is selected. Use the +/- buttons to select the power level. Put the mouth piece into your mouth so that it rests against your teeth. Once in place relax your lips over the mouth piece. Press the start/pause button to start treatment. The lights on the countdown timer will indicate the time remaining. 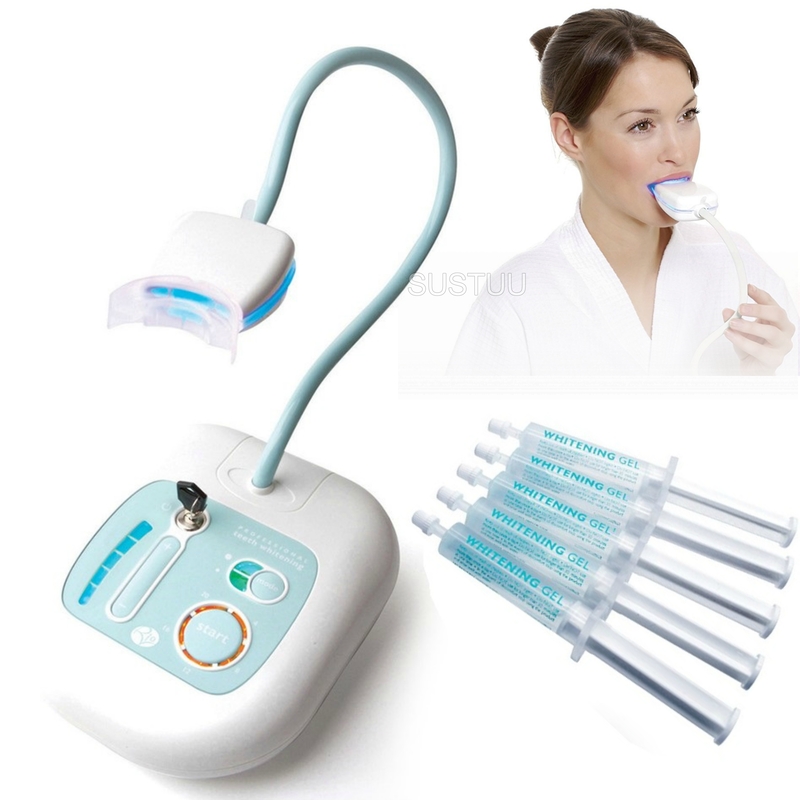 When the treatment is complete remove the mouth piece from the blue light transmitter and wash well with warm water. Allow to air dry before storing. Make sure you Rinse out your mouth with water (do not swallow). In most cases you will start to see results immediately after the first treatment. It is not unusual for teeth to whiten by several shades during the first few applications. However, results do vary from user to user. Yellow stains respond very quickly and dramatically in comparison to dull, blue/grey stains which are poor to respond. If you have particularly deep staining to your teeth a number of treatments may be required. The number of top-up treatments required will depend on your age and diet. If you continue to eat the foods and drinks which have caused staining to your teeth your teeth will re-stain over time. Initially the treatment is safe to use weekly or even daily for the first month. Once you have reached your goal top-up treatments are recommended once a month, providing you take proper care of your teeth as instructed by your dentist. 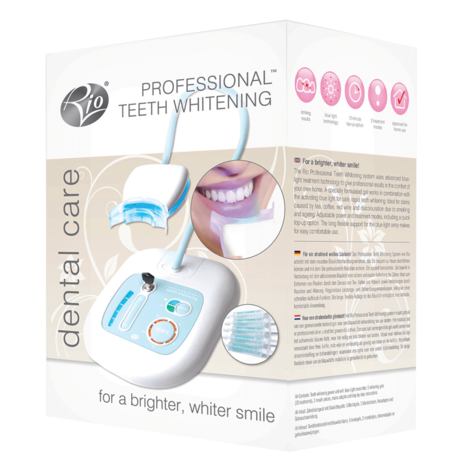 The Rio Professional teeth whitening kit will only whiten natural teeth but is safe to use on false teeth. You will need to have any false teeth replaced if you want them to match your new white teeth. 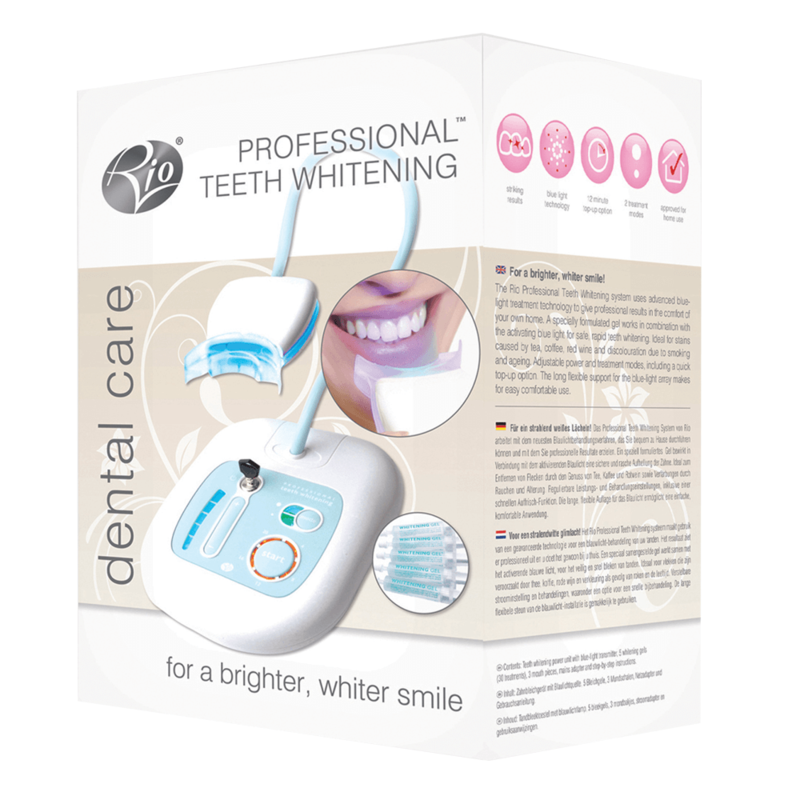 The whitening gel uses stain removers which are of a food grade and are blended to a safe strength. 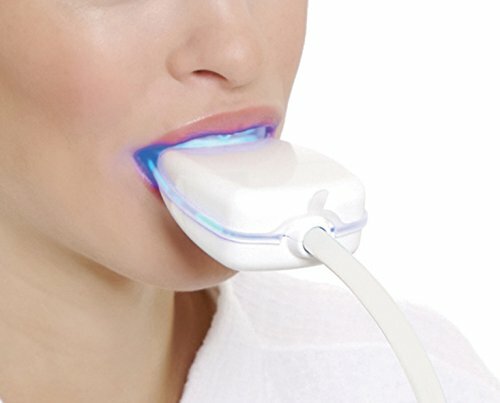 The blue light causes no damage to the teeth or gums provided the kit is used in the correct way following the enclosed instructions. Ideal for stains and discolouration.